Boasting Usta art on an old Burma teak-paneled ceiling complemented by an expansive painted frieze depicting hunting scenes, Swarna Mahal offers elaborate regional cuisine alongside an authentic dining experience that once entertained the Maharajah and his notable guests. Displaying a hand-painted panel of stone, the original accents and architectural features of the restaurant have been carefully preserved, celebrating the former glory of the palace. 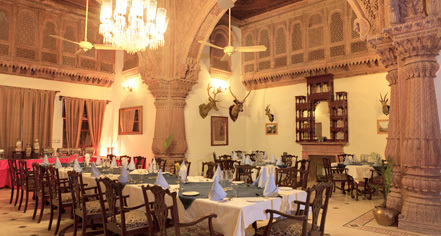 Serving a traditional Rajasthani thali, Swarna Mahal also offers a diverse à la carte menu. Open from 7:30 a.m. to 11:30 p.m.
Reservations are recommended and can be made at reception. Displaying a green Oliver Messel decorative motif, the Hari Mahal restaurant is a refined banquet-style dining room furnished with wall-to-wall tables and sideboards. 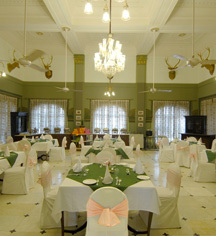 Large breakfast buffets, lunches, and dinners are available for guests visiting the palace for private functions. Boasting a truly unique atmosphere, Trophy Bar offers stellar cocktails in a regal establishment. Reminiscent of the palace's original splendor and illustrious history, the bar boasts a display of exotic mounted trophies of past royal hunts. Among the collection of hair-raising prizes include Nepalese bison, Royal Bengal tigers, leopards, coyotes, and a pair of lionesses.